British cosmetics firm Lush announced this week that it will closing several of its social media accounts. The company cited paying to engage with customers as one of the many issues it has with social media. Lush has decided to kick it old school, encouraging their customers to use live chat, email or phone. This is a bold move for a company with 569,00 Instagram followers and 202,00 Twitter followers. More than 423,000 people like them on Facebook but numbers clearly aren’t enough. Lush must have looked at the return on investment and decided it wasn’t worth it. The announcement sent social media managers into a tailspin. Social media is their bread and butter after all and they’ve spent years telling the world and his wife how important social media is and why everyone should have a Facebook page. Many berated the company and offered advice on where they went wrong and how they could have done better. 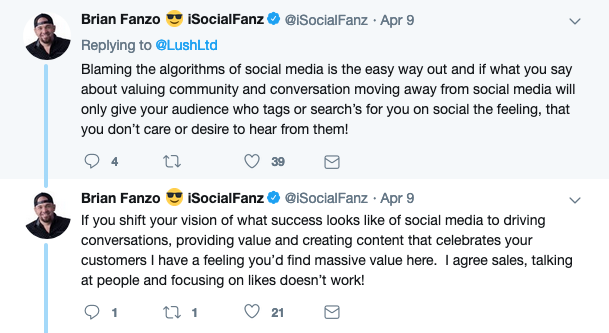 Lush isn’t the only big company to leave social media behind. In 2018, the pub chain JD Wetherspoon quit social media stating concerns that pub managers were being side-tracked from the real job of serving customers. Wetherspoon Chairman Tim Martin told the BBC that society would be better off if people cut the amount of social media use. He said that if people “limited their social media to half an hour a day, they’d be mentally and physically better off”. As a social media manager, I personally think this is a brave move. Social media was heralded as an opportunity for businesses to engage more closely with customers and get useful actionable feedback. This is mostly true but there is the matter of the ever changing algorithm forcing you to pay more to reach your customers. And of course in this age of callout and cancel culture, it’s also an easy way for disgruntled people to harass and hold brand hostage. Not having a social media presence won’t stop this but it does free up the time to deal with genuine complaints and concerns. Social media isn’t going away anytime soon so I don’t think social media experts need worry about losing their jobs.